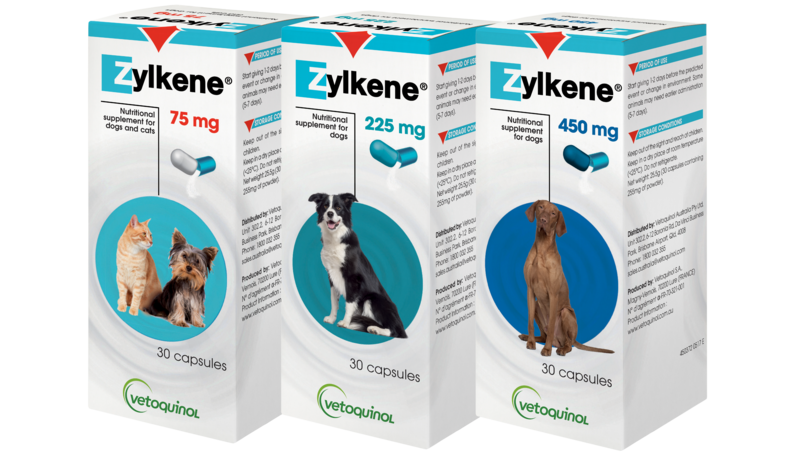 Zylkene can help support dogs and cats in situations where they find they need to adapt their behaviour to cope. These can include kennel and cattery stays, moving house, the arrival of a new pet or baby, sudden noises such as fireworks, travel or festivities. Many cats do not cope well in a multi-cat household. There are many ways our pets can respond to new and unpredictable situations and not all animals will respond the same way.Even the most seemingly innocuous situations and experiences can trigger your pet's uneasiness when they are in unusual or unpredictable situations. Different animals are not all susceptible to the same things, for example some dogs and the attention of many people at once whilst some react very differently, hiding away. Similarly, some cats love being picked up but others do not. The 2 Vets Talk Pets podcast is a podcast brought to you by Dr Lewis Kirkham and Dr Robbie Anderton, and features information and stories on animals and veterinary medicine but with a lighthearted, fun approach. Listen to episode 25 of the 2 Vets Talk Pets podcast, sponsored by Zylkene: https://bit.ly/2Nbz7d2 Available on Apple podcasts, Google podcasts, Stitcher and most other podcast outlets. Even the most seemingly innocuous situations and experiences can trigger pets’ discomfort when they are in unusual or unpredictable situations. The alpha casozepine in Zylkene®is made following best quality standards from the farming of the dairy cows to the casein hydrolysis manufacturing process, which complies with certifications ISO 9001 and ISO 22000. Zylkene® is easy to give in one daily intake. The capsules contain a palatable, water soluble powder that appeals to both dogs and cats. They can be given whole or opened and the powder mixed with food, treats or liquids. Since Zylkene is taken orally and ingested, it is present wherever the pet goes, both inside and outside the house. Water should always be available to your pet. Our pets tell us how they are feeling by exhibiting different behaviours. Sometimes this is very noticable but they can also be very subtle. When there is a change in a pet's behaviour we should take note as they may need some help in overcoming a stressful situation or change to their environment, even if it is just temporary. It's important to remember that every animal is different and this includes how they respond to changes in their routine or environment. Even positive changes such as a new baby in the house can lead to unwanted behaviours such as excessive vocalisation or soiling the house. Dogs in kennels may also pace and bark more than usual. Fireworks, thunder and other loud noises may cause you pet to hide or exhibit other nervous behaviours. Altered behaviour in your pet can be a sign that they are struggling to cope and it is worthwhile to discuss it with you local vet clinic. You can also check our Downloadable Guides section to find information on Zylkene and how to use it. Here you can also find leaflets with information tailored to specific situations that may be stressful for your pet, such as moving house, fireworks and kennel or cattery stays. You can also find useful content and information in our guides dedicated to common situations that many pets find stressful. Here you'll find advice on how to approach the situation and to help your pet cope as well as possible. THEIR HAPPINESS IS YOUR HAPPINESS. AS A PET PARENT, IT'S UP TO YOU TO KEEP YOUR EYES AND EARS OPEN. Understanding your pet's behaviour can make life easier for them, and for you, too! Big or small, changes in their day-to-day routine can be upsetting to your pet. Just like people, pets do not all react the same.... Some cats are comfortable visiting the vet, while others cringe at the sight of a carrier! Some dogs like the attention of many people at a time, while others prefer to be on their own. Since your pet cannot "tell" you, try to keep an eye on behavioral changes. A pet who is playing less, licking or biting excessively, destroying furniture or peeing in the house is not comfortable. For some unusual behaviours, Zylkene® can help your pet adapt calmly to changing situations. Talk to your veterinarian and browse through our tips to better understand your four-legged friend's reality! Below you can find some tips on managing your pets, with more to come!